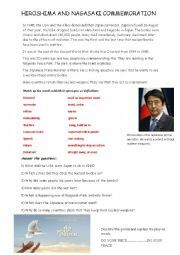 Brief details about the bombing of Japan and the commemoration. They could follow up with their own peace posters. 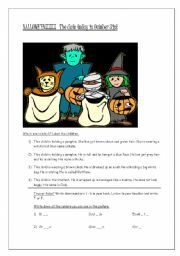 There are three sheets consisting of activities describing a Halloween picture. 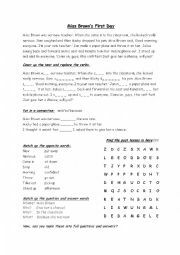 There are gap fill exercises, word and vowel; match up - descriptions and picture and a wordsearch. 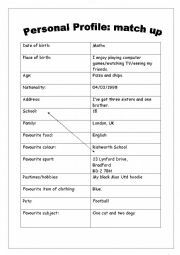 I suggest a true/false, but haven´t included sentences as any teacher can make these up on the spot. Nice picture. Two pages. A passage with exercises. I prepared this as a vocabulary study for my students. Hope it will be useful. 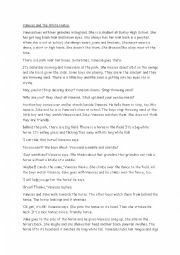 This is a short story in the present tense. Vanessa shows off by trying to ride a horse while standing up! What you see is what you get! A basic match up to make a personal profile. 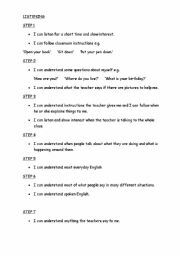 It´s important for students when it comes to form filling and helpful when introducing themselves. 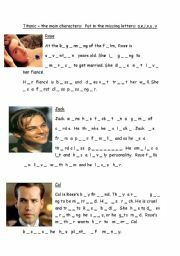 This sheet is based on Titanic The Movie and describes Rose, Jack and cal. The students have to re-place the missing vowels.The pictures can then be used to prompt responses about the characters. 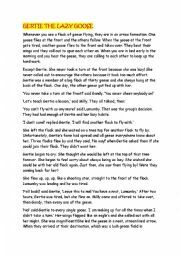 A short story in the form of a fable. I ask the student to think up suitable morals. 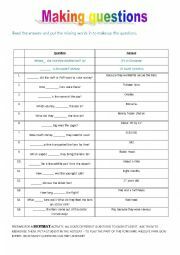 True or false and comprehension questions. 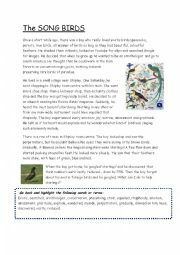 This is a short reading passage with exercises. I remember the first lesson I taught. I was so nervous, I fiddled with my beads! Then the string snapped and the beads scattered everywhere. All the students jumped up and picked them all up for me. Only download this if you are also downloading my ws ´Lion Rescue.´ Btw, there are youtube links to the story - type in ´Romanian lions´. Sorry I did this sheet separately. I have put the NASSEA step level assessments into students speak so that students can be involved with their own assessments and target setting.